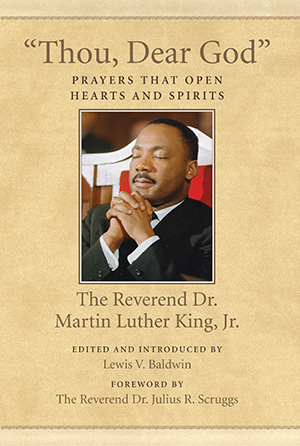 Beacon Press: "Thou, Dear God"
“Thou, Dear God“ is the first and only collection of sixty-eight prayers by Martin Luther King, Jr. Throughout his life, the Reverend Dr. Martin Luther King, Jr., turned to prayer for his own spiritual fulfillment while also delivering prayers to the public as a way to inspire and reaffirm a quest for peace and social justice. “Thou, Dear God” is the first and only collection of prayers by Dr. King. Arranged thematically for all seasons of life—including prayers for spiritual guidance, special occasions, and times of adversity and trial—each section is introduced by minister and scholar Lewis V. Baldwin. From the private words King recited as a seminarian and graduate student to the powerful public sermons he delivered as a preacher and civil rights leader, these prayers will prick the conscience, stimulate the intellect, and rekindle the spirit.